Bit Of A Day Today...My Neighbours Had A Lucky Escape... A Lesson To Us All! Through a magnificent chain of events today...my neighbours (& us) will end the day to tell the tale!!!!!!!! I was working at my kitchen table first thing. Normally, I am up in my loft workroom beavering away but today I was waiting for a customer to collect a dolls house. Suddenly about 9.30ish, above the noise of the radio, I heard next door’s alarm go off...I just assumed that it was their smoke alarm and neighbour “Jack” was burning his breakfast...again! However, as it went on and on, hubby came in and asked me what the noise was. I just casually replied that it was probably neighbours cooking breakfast......”BUT they couldn’t be” hubby says....”I saw them go out in their car about 20 minutes ago”!! We both raced to the back garden....hung over the fence to see if we could spot any smoke or flames....I kid you not! No sign of fire but grabbed their key (we have for emergencies) and cautiously entered their house. The noise was incredible as by this time, there were two alarms going off....but we were baffled as it was not coming from their smoke alarm in the hall. Although there was no smell of smoke, the air in the kitchen was really odd....so stuffy that we wanted to get out quickly....was not nice. We discovered that the noise was coming from two carbon monoxide detectors in the kitchen, sitting side by side on a cupboard? Very quickly, we got out of the place. Meanwhile, never having had to deal with this sort of thing before, quickly Googled "carbon monoxide detectors" on the internet to find out more.........OMG, I really hadn't realised to quite the extent on how dangerous all this was! My elderly neighbours had gone shopping and oblivious to this. We sat through the noise of their alarms....pondering on what to do. On their return about an hour later, we grabbed them, warned them on what had happened and tried to deter them from going in the house. We rang the gas board from our house, followed their clear instructions – turned gas off at mains, opened all windows and doors and vacated the property etc. The "Carbon Monoxide Detector Guy" came very promptly. Over the next couple of hours he proceeded to test everything, including everything in our house and surrounding grounds too. Phew....our house was given the all clear and deemed safe. As there was only a brick wall to separate our semi detached houses....it could have been dangerous for us as well. By now, another engineer from the gas board arrived......very quickly it was determined that it was next door's ancient boiler........leaking carbon monoxide into the kitchen. My neighbours were very lucky indeed. Without those detectors, they or us would not have known that there was a problem. In a short space of time they could have fallen unconscious. Had they been in when the dangerous carbon monoxide levels occurred, had we not been around to hear their alarms to warn them about going into the house, or had this happened at night, we may not have heard their alarms so quickly and my neighbours being deaf, may not have heard them at all.......the consequence does not bear thinking about. We wondered why they had two detectors? Jack explained that they had bought very recently a brand new one that was on special offer at a local supermarket, as their other one was very old and he wasn't sure if it still worked. They thought it was a bargain price......how right they were in more ways than one.....it helped to save their life! As for us....well, although we have three smoke alarms in the house (one on each level), it has NEVER occurred to us to get a carbon monoxide detector. We have our boiler serviced regularly....but then so did our neighbours! Guess what I will be buying tomorrow! I hope anyone reading this tale, may consider purchasing one too. The Thame Fair Stock Page has now been set up and all new handmade items that will be for sale at the Thame Dolls House & Miniatures Fair (18th February), will be listed on there. This will continually be added to as the items leave my workroom! I hope to have a variety of different and quite unique items on offer that day. 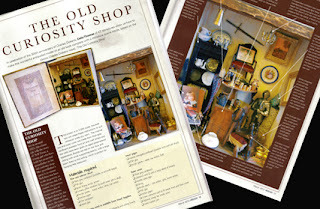 Very shortly I will begin to list antique/vintage items too. All items listed will not be available before the event and cannot be reserved beforehand - they will be sold on a first come, first serve basis. So if you have your eyes on something specific.....it may be a good idea to come to the fair early! The fair opens at 10.00am. All unsold stock after the fair will be listed for sale on KT Miniatures website . The feature will give you full instructions on how to make this project of an antiquated scene of an old shop based on Charles Dickens' novel - The Old Curiosity Shop, set inside a model of an old book. The outer cover was based on an original 1930s copy of this book that belonged to my late father in law, when he was a lad. I really enjoyed making this particular project as it was refreshing to be tackling and creating something in the Victorian era for a change....rather than the 1930s-1940s era which is more the norm for me! Great fun. 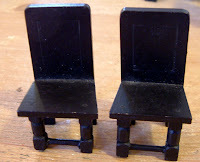 A combination of broken vintage dolls house furniture as well as modern reproduction bits and pieces, plus some of my own handmade miniatures eg. old books and biblical print etc. were used to fill this scene. So....if like me, you have a very large "bit box" that contains broken dolls house furniture and bits (old and new) that you simply could not bear to throw away as you knew that it would be useful for something one day.....then this project may be perfect for you! 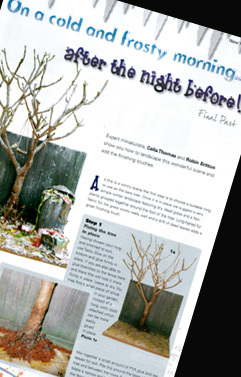 FINAL PART OF "ON A COLD & FROSTY MORNING, AFTER THE NIGHT BEFORE"
Also in the same magazine, on page 63, is the final part of Robin Britton and my feature on how to make an old fashioned scene of an old backyard, complete with rusty old dustbin with the remnants of a party spilling out....and a touch of frost. This final part concentrates on the landscaping. We are now in the final stages of this auction and the closing date will be at 3.00pm on Saturday 18th February at The Thame Dolls House & Miniatures Fair. So, if you would like to bid for this unique scene, don't delay.....click on the above link now and see how to bid! 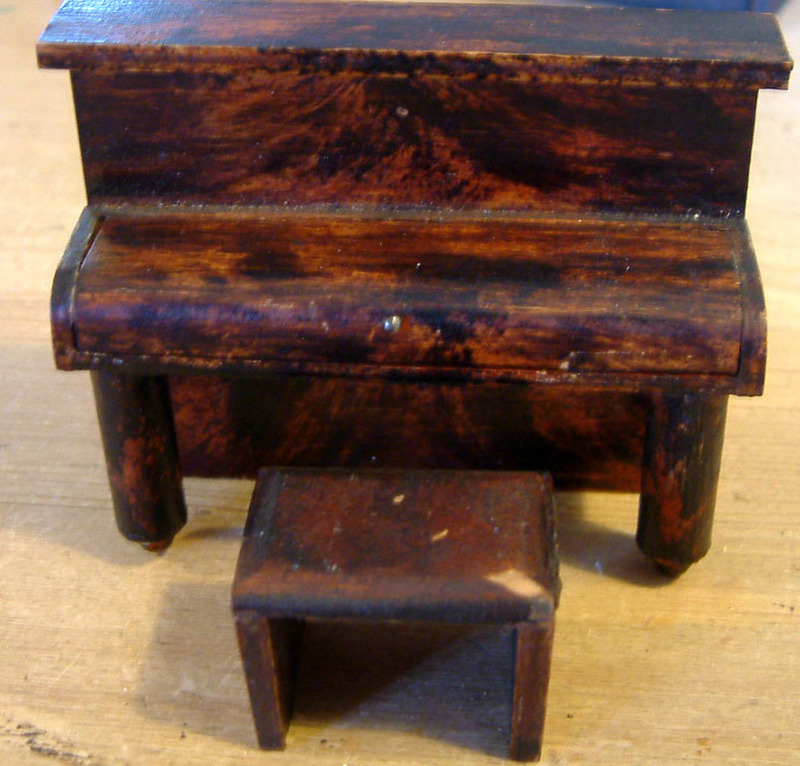 Readers of my subscribed to KT Miniatures Newsletter earlier on in the week, will have seen that I was offering certain dolls houses and a room box at greatly reduced prices as a special January offer. Here at KT Miniatures, I have been having a very early spring clean as there is only a limited amount of storage space ( I work from home) and am in desperate need of more space to make way for new stock. All items that were offered earlier on in the week have been sold apart from just one more dolls house......this vintage German Open Plan House. It has been lingering for a long while on my website and has to go. It is not to everyone's taste....a bit like Marmite....you will either love it or hate it! 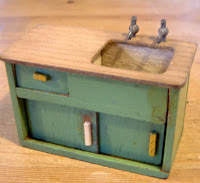 This was originally sold to me as a 1950s dolls house.....it maybe 1950s or early 1960s. It is certainly vintage and very kitsch! Still has the original lights - although they will need attention in order to get them to work. This is now on offer for just £30.00........a silly price but it really must go! This offer ends on January 31st 2012. Strict conditions will apply and this will be non negotiable (see below). Offered on a first come, first serve basis. 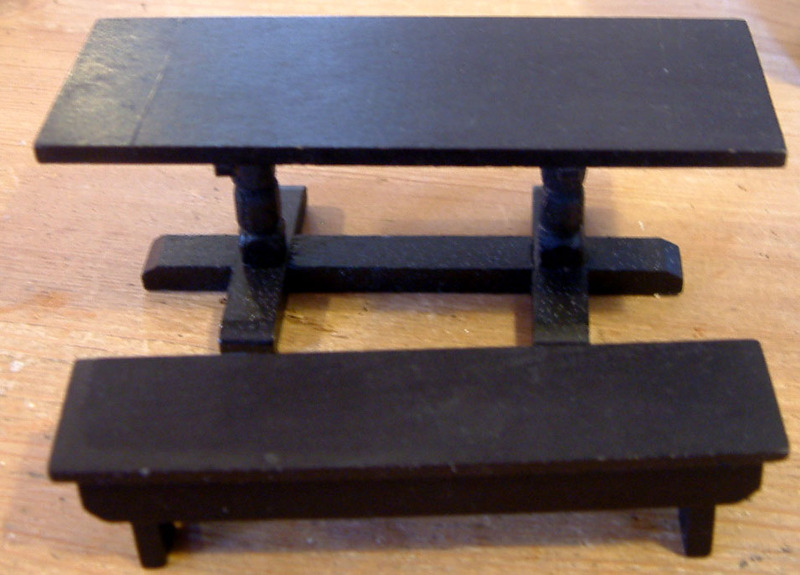 Please email me, Celia, at: info@ktminiatures.com or ring: 01844 212520 if you are interested. I am based in Thame, Oxfordshire....just a couple of miles from junctions 6-8 M40. This dolls house must be collected in person from me here in Thame at a mutually agreed time by February 2nd at the very latest. Cash to be paid on collection. If the house has not been collected by February 2nd, this offer will no longer be applicable. 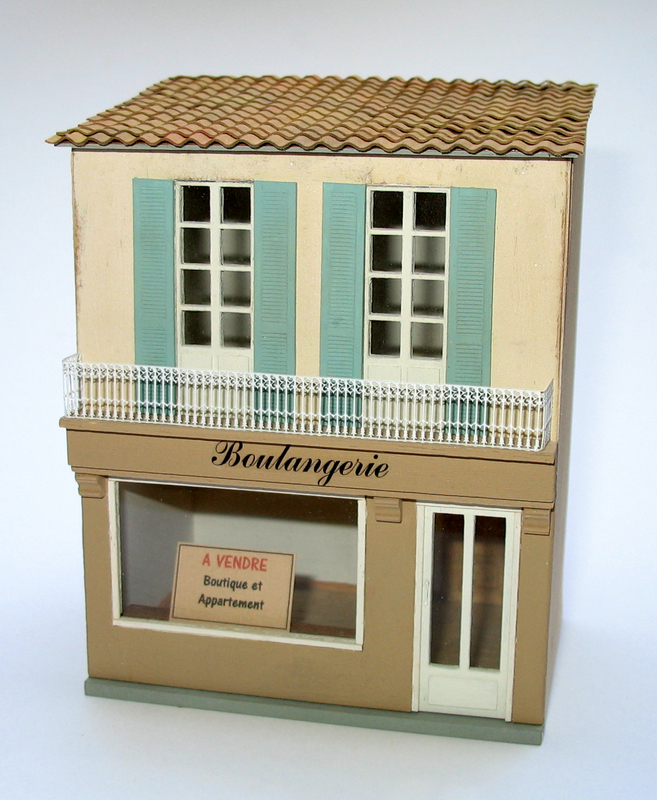 After this date, if this dolls house is not sold, it will be taken off KT Miniatures website and will no longer be available. 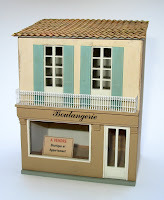 As soon as this little dolls house was featured on KT Miniatures Newsletter earlier this week, the phone started ringing and emails began to flow with people enquiring about it. Needless to say, that it was snapped up immediately before it even reached my website. However I am not surprised. As soon as I set eyes on it, I knew it was something very special. 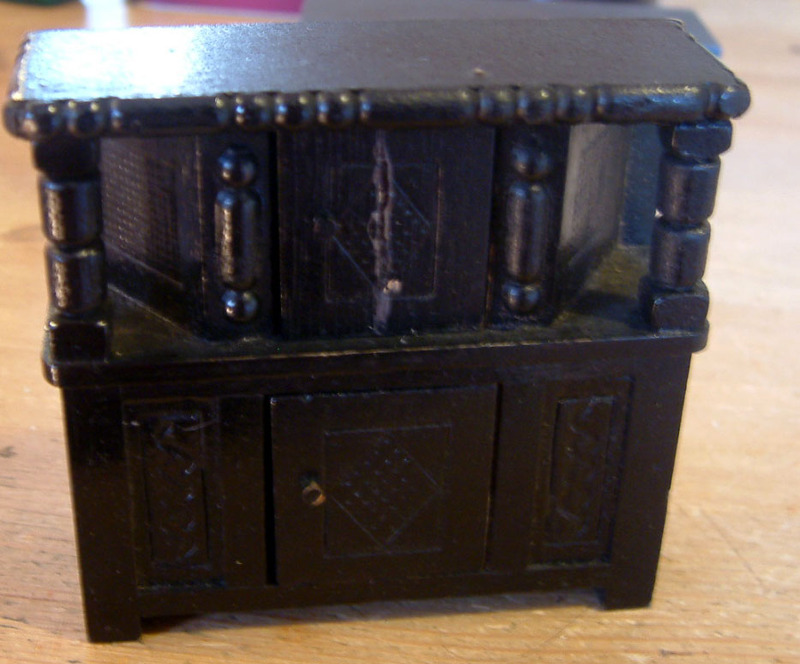 It is understood to be a c1930s Betal Dolls House By J & H. Glasman Ltd. 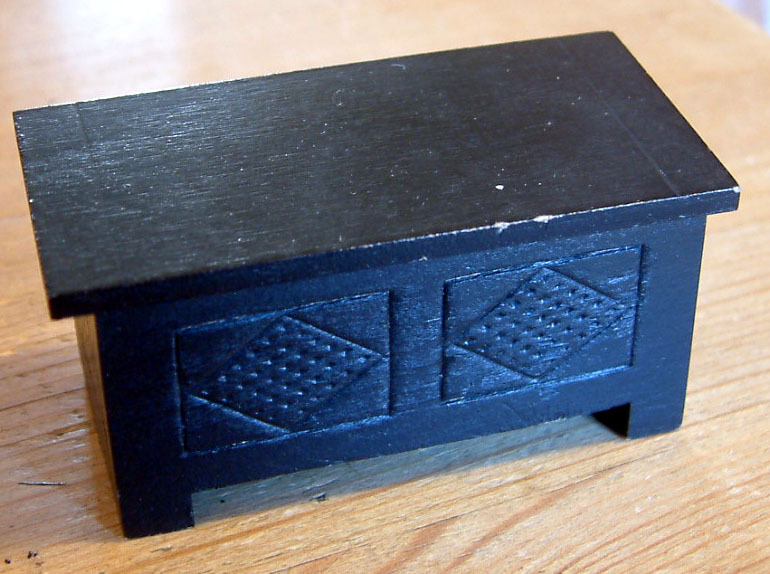 It is tiny, measuring just 16 ½” wide x 10” deep x 16” high. 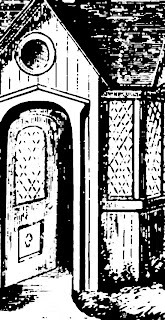 The interior consists of two rooms and the frontage opens as one, with three earlier versions of Romside tin windows.....more about those in a minute. The interior and exterior decor is in completely original condition - with the inside rooms painted very simply in a pastel pink and pastel blue. The floor is just plain wood- no paper covering or paint. The exterior is covered in an off white/creamy matt colour with hand painted mock greenery and flowers on the front, very similar to what other manufacturers were doing at that time (& indeed for many years). To be honest, it was the front door with the triangular canopy and the way the roof was constructed that eventually led me to believe it was a Betal Dolls House. This is quite rare......and in 16 years of trading, I have never handled one before- so is very exciting! "A-Z 1914 to 1941 DOLLS HOUSES".....and an image of someone's Betal bungalow on the internet found by Googling "Betal Dolls House". Oddly enough, there are some larger Betal dolls houses in a separate advert in Marion's book but this is nothing like them. It bears more resemblance to the Betal bungalows. The roof is covered in a kind of textured material - like sandpaper with some random splodges of green. The ordinary tin green/yellow Romside windows were prolifically used by many manufacturers over the years in their dolls houses. 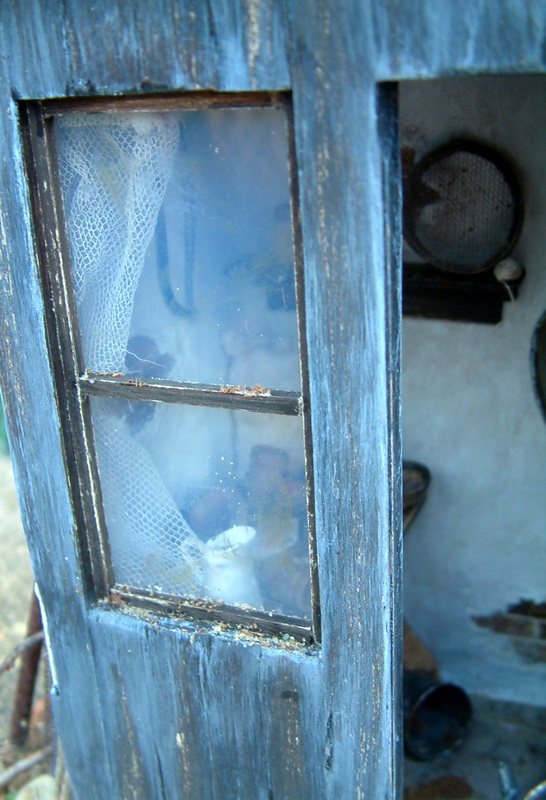 But if you look carefully at these particular windows, you will notice that not only do they not have those little butterfly handles, but at each edge they have a very thin metal rod which enables the windows to swivel open. My understanding has always been that they were the fore runners to the latter ordinary version of Romside windows with butterfly handles and tab hinges....so pre-war 1930s. I have seen them a few times over the years, but not very often. It could be that they are particularly fragile in young hands....so many probably did not survive. Sorry but as mentioned earlier, this dolls house is sold but due to the large amount of interest prompted from this appearing in my newsletter, thought it would be nice to show everyone the photos. If you wish to receive my free emailed newsletter then please click on the link on the left hand column of any page on KT Miniatures website, then follow the instructions. I try and email out a newsletter approx 1-2 weeks, sometimes more....and sometimes less. 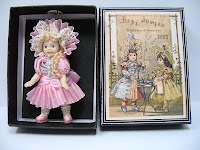 Often, if any dolls house or special item comes in, it is mentioned in the newsletter first so subscribers often have the opportunity of purchasing without an item ever reaching my website. This helps me out as photographing and listing extensively for the website is extremely time consuming. If once you have signed up and you ever decide that you do not wish to receive it anymore, you simply click the Unsubscribe Button under each newsletter or email me and I can take you off the database. Monday Catch Up......a breather in between making. Well I simply cannot believe that its already the 16th and we are halfway through January. Where's the first half of January gone?!!! With "the big event" looming rapidly next month, I currently classify my passing of time on exactly "how many more creating days until Thame Fair"! I'm sure other artisans who are coming to Thame, feel the same. It has been soooooo cold up in my loft workroom for the past couple of days and now my little heater has well and truly bust ......so I have had to move my "workroom" down to the kitchen table where its considerably warmer! What I did not bank on was Molly, the eldest of our two cats, suddenly develop a passion (& talent) for yanking out strips of my newly arrived wood right out from the box it arrived in and chew on it. She has NEVER done anything like that before....good job the wood is intended for some distressed miniatures then....shame her teeth marks are not in keeping with the 1/12th scale though!!! Today, I took a much needed breather from creating and have spent the entire day photographing and listing vintage miniature goodies onto KT Miniatures website. So currently available on the Vintage Barton 1/16th Page, are various furniture pieces from the Barton Tudor & Jacobean Range, such as this table and monk's bench plus chairs. 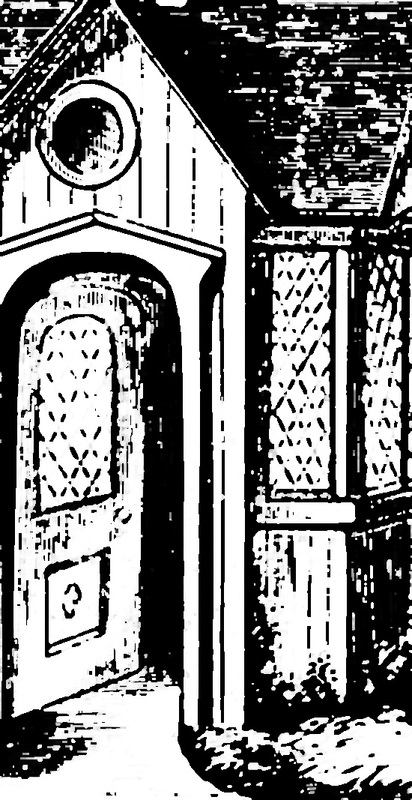 There is also this court cupboard, with the distinctive Barton moulding and engraving. This particular example has a crack in the upper door though, so is being sold at a greatly reduced price than if it was in pristine condition. The coffer is a nice versatile piece and could be used in other rooms, as well as the dining room. All these Tudor pieces would look great even in a pre-war dolls house,as the Jacobean look was quite trendy in the 1920s/30s houses. 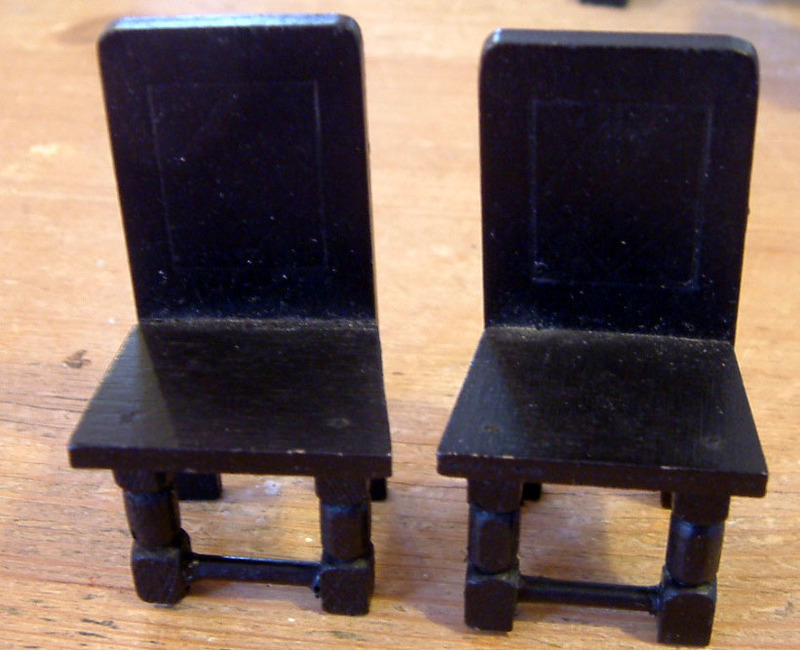 Amongst some of the other more unusual pieces are some highly sought after Tiny Toy furniture, circa 1930s. This piano has a mottled black and brown finish and it came with the stool however I am not convinced that the stool is the original one, as there is no mottled colouring, just simply dark varnish. 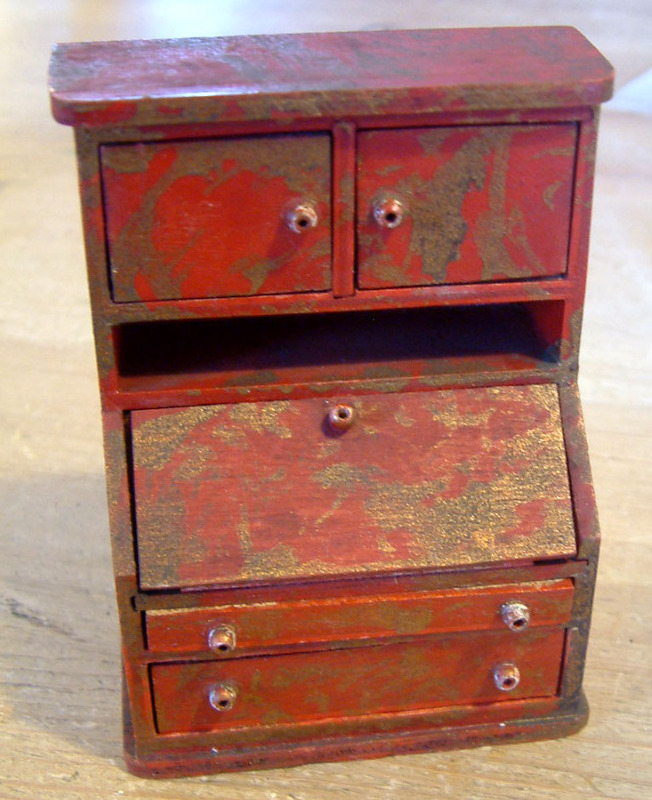 An instantly recognisable piece is this upright bureau, in the more distinctive red and gold mottled finish that Tiny Toy are renowned for. 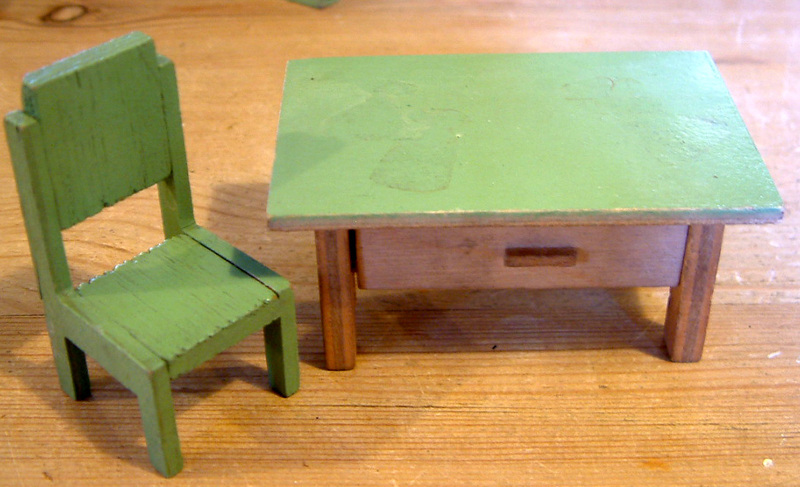 All these Tiny Toy pieces can be found on the Vintage 1/16th Others Page. 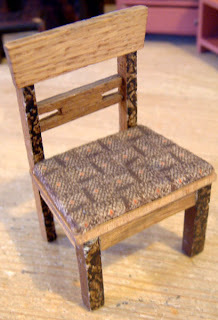 Finally.....here is one of my real favourites just listed today....a 1930s German chair.....isn't it wonderful!? 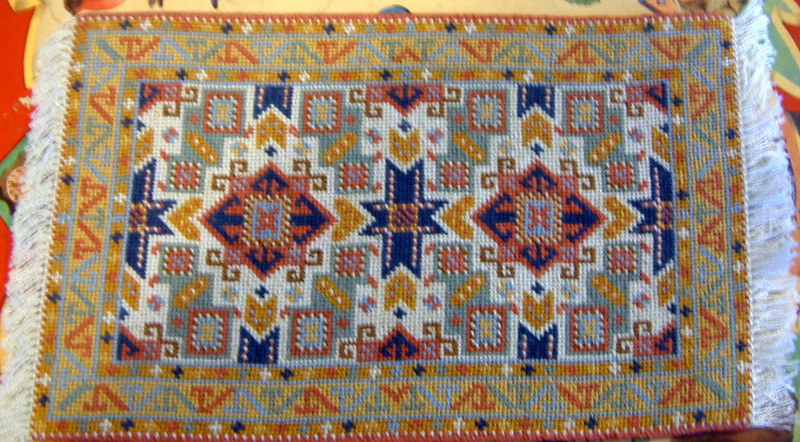 This can be found on the Antique 1/12th Living/Dining Page. Over the next few days, I have lots more vintage pieces to list onto the website....but will have to do so in between the creating. So please do keep checking the website and don't hesitate to email or ring to reserve..
Latest On The Breast Cancer Campaign Raffle - Do Take A Look!!! Miniaturist artisan's generosity has never ceased to amaze me where the Breast Cancer Campaign Raffle is concerned........which is held at the annual Thame Dolls House & Miniatures Fair every February. This year, is no exception. I have already shown you some of the amazing artisan prizes donated on here in a previous posting.....but there have been loads more since then.....here is a brief update on the new arrivals of donations & pledges. Raffle tickets will be £1.00 each and available on the day at Thame Fair which is being held on Saturday 18th February at Thame Leisure Centre, Thame in Oxfordshire. La Boutique Francais 1/48th Scale Kit By Jane Harrop, WW2 Soldier 1/12th Scale By Robin Britton Of Coombe Crafts & Little Porcelain Dolls House Doll By Sandra Morris Of Tower House Dolls. Turned Pot With Removable Lid In Bethlehem Olive Wood, Unique Turned Acrylic Bottles Plus Handmade Mirror - All By David Williams Of Harvington Miniatures. 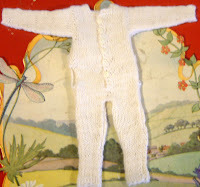 Dressed Doll By Mary Williams, Gentleman's Combinations With Hygenic Back Flap By Isobel Hockey & Embroidered Rug By Felicity Holland Of Ronfel Enterprises(Thame Fair Organiser). Lots more donations have been promised which is exciting plus on the day of the fair there will be many donations from the standholders too. 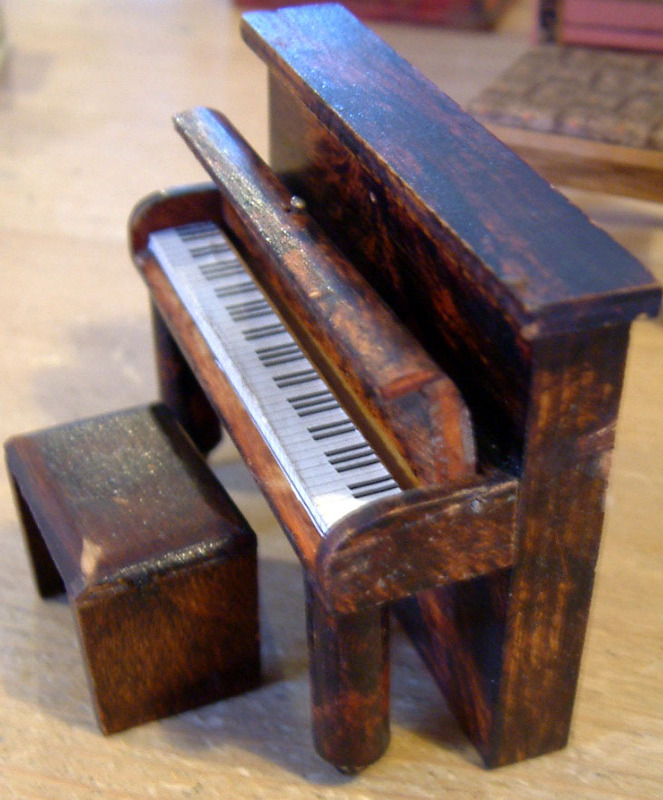 Meanwhile, if you are a professional miniaturist artisan, UK or overseas, and would like to donate an item(s) of your work to this well worthy cause.....please get in touch with me, Celia Thomas of KT Miniatures. Thank you to everyone who has already donated......and please, please....if you can, do come along to Thame Dolls House & Miniatures Fair and help us raise lots of money for Breast Cancer Campaign. 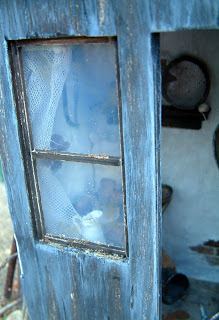 Just A Quick Peek At Our Little Old Shed Workshop Prototype....In 1/12th Scale! Well, am pleased to say that we have finally completed the 1/12th scale prototype for The Little Old Garden Shed Workshop which will be taking place in March, at Waterperry Gardens in Oxfordshire. This, our little old shed......was the old wash house (or outhouse) almost a century ago....that long fell into ruin. All that’s left of the original building being the back and a side rendered wall, with some bricks clearly visible where rendering has fallen away. We have plenty of spaces for this, our brand new half day workshop that is taking place in Thame on April 29th. If you click on the above link, you will find all the details plus a downloadable booking form. 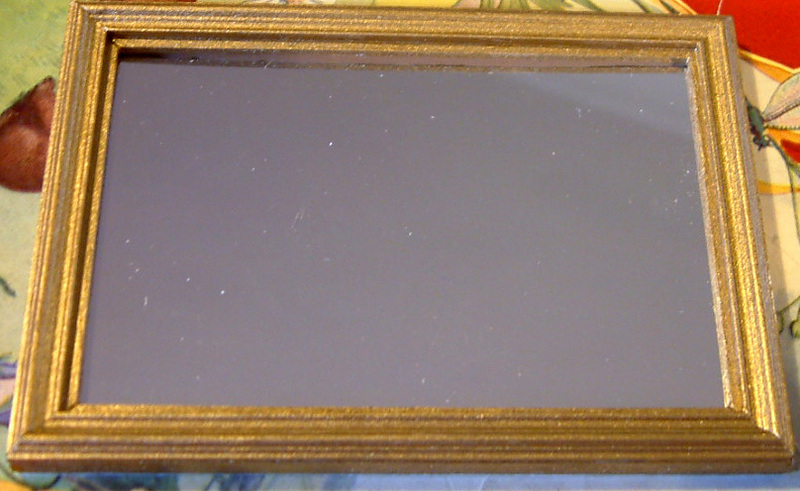 At last I have been able to embark on photographing and listing more 1/16th scale vintage items on KT Miniatures website. 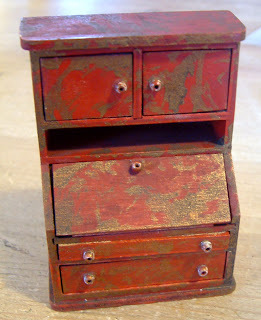 Amongst those listed today are some late 1940s pieces...all that came with a c1948 dolls house. 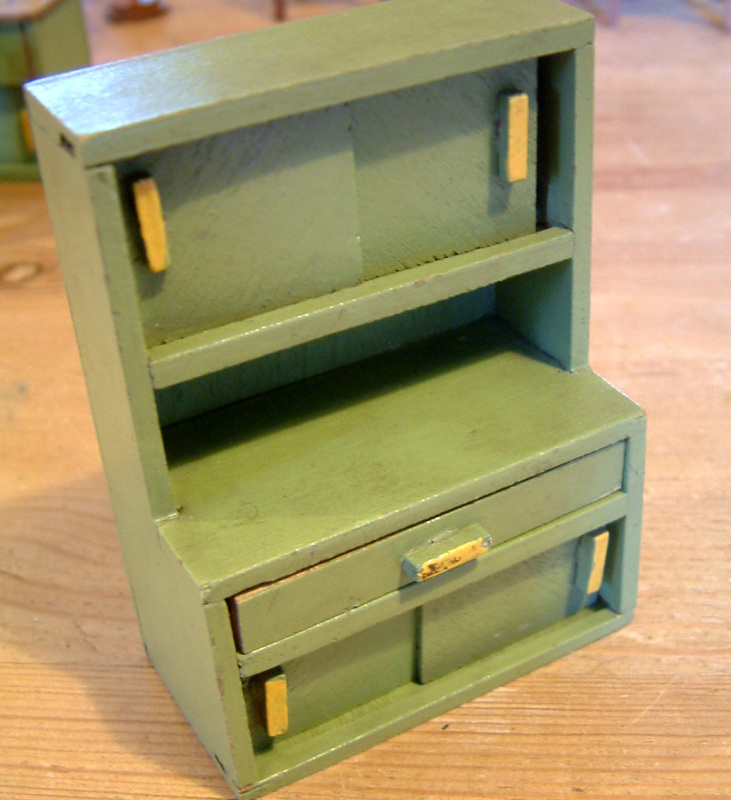 You will instantly recognise this as a green painted Barton dresser, that was readily available during the 1950s. 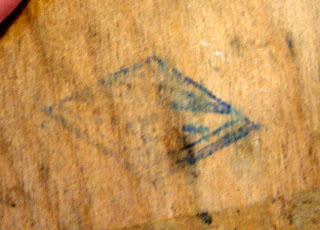 However, apart from knowing that the previous owner was given this with her lovely dolls house in 1948 for her birthday, on the reverse is the tell tale diamond ink stamp that could be found on Barton furniture from 1946 to 1948/9. The previous owner also was given a matching table and chair plus sink, but these do not have the diamond ink stamp. I understand though that from 1948 Barton introduced a red and black label that was gummed to the reverse of the furniture.....all of which had a tendency to fall off. In fact, I have to say that I have yet to handle a piece of Barton furniture with a gummed label on. These Barton pieces can be found on the VINTAGE BARTON 1/16TH PAGE. 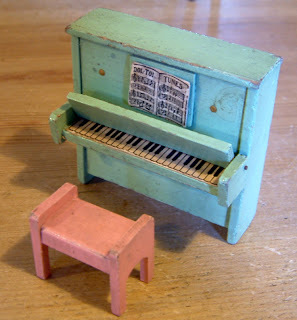 Other accompanying furniture from the same 1948 dolls house are some interesting Dol-Toi pieces such as this pale green piano and pink stool. There is this very nice wooden standard lamp with original patterned card lampshade plus a real favourite of mine, a wooden bookcase with all original nine Dol-Toi books - all of which are in remarkably good condition considering they are 64 years old! What is particularly nice is there are actually three shelves on this bookcase, as if you look carefully the top has a small ledge - perfect for ornaments or plants etc. I will continue listing more furniture from the same 1948 dolls house plus other vintage items over the next few days. 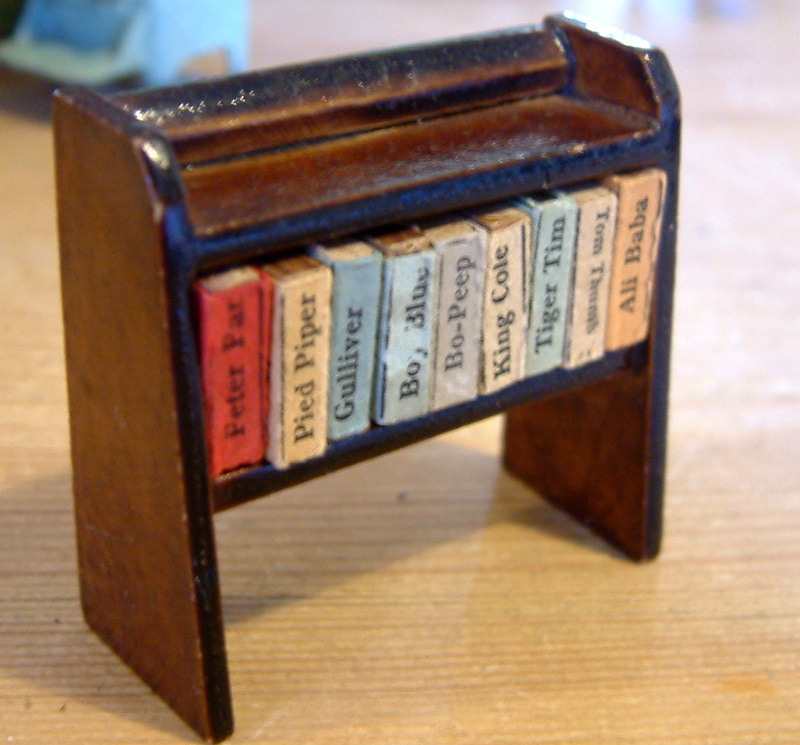 After a truly fabulous festive break, KT Miniatures is now back open for business. 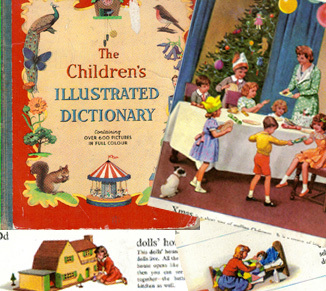 Over the holidays, I visited one of my many brothers who dug out from his loft, a gorgeous old illustrated dictionary, that we all each had in turn as kids through the 1950s and 60s. I will be using it for a project that I am working on. Flicking through it again has brought back so many wonderful sentimental memories....my real favourites as a child were the picture of the dolls house and little girl "nursing" her doll.....arn't they just wonderful....although oh dear, some naughty person scribbled the pillow in pen...ummm...(am blushing as I type)! Oh to be five years old again!